Historical drought information for Oklahoma climate division 2, which covers the Kaw, Kaw/Ponca, western Otoe-Missouria, Ponca, and Tonkawa tribal jurisdictions and Alfalfa, Garfield, Grant, Kay, Major, Noble, Woods, and Woodward counties. Historical drought information for Oklahoma climate division 3, which covers northern Cherokee, northern Creek, Eastern Shawnee, Miami, Miami/Peoria, Modoc, Osage, eastern Otoe-Missouria, Ottawa, Pawnee, Peoria, Quapaw, Seneca-Cayuga, and Wyandotte tribal jurisdictions and Craig, Delaware, Mayes, Nowata, Osage, Ottawa, Pawnee, Rogers, Tulsa, and Washington counties. Historical drought information for Oklahoma climate division 4, which covers the northwestern corner of the Caddo-Wichita-Delaware, and much of the Cheyenne-Arapaho tribal jurisdictions and the Beckham, Blaine, Custer, Dewey, Roger Mills, and Washita counties. Historical drought information for Oklahoma climate division 5, which covers far eastern Caddo-Wichita-Delaware, far eastern Cheyenne-Arapaho, northern Chickasaw, Citizen Potawatomi Nation-Absentee Shawnee, western Creek, Creek/Seminole, Iowa, Kickapoo, a small portion of Kiowa-Comanche-Apache-Fort Sill Apache and eastern Kiowa-Comanche-Apache-Ft Sill Apache/Caddo-Wichita-Delaware, and Sac and Fox tribal jurisdictions, and the Canadian, Cleveland, Creek, Grady, Kingfisher, Lincoln, Logan, McClain, Okfuskee, Oklahoma, Payne, Pottawatomie, and Seminole counties. 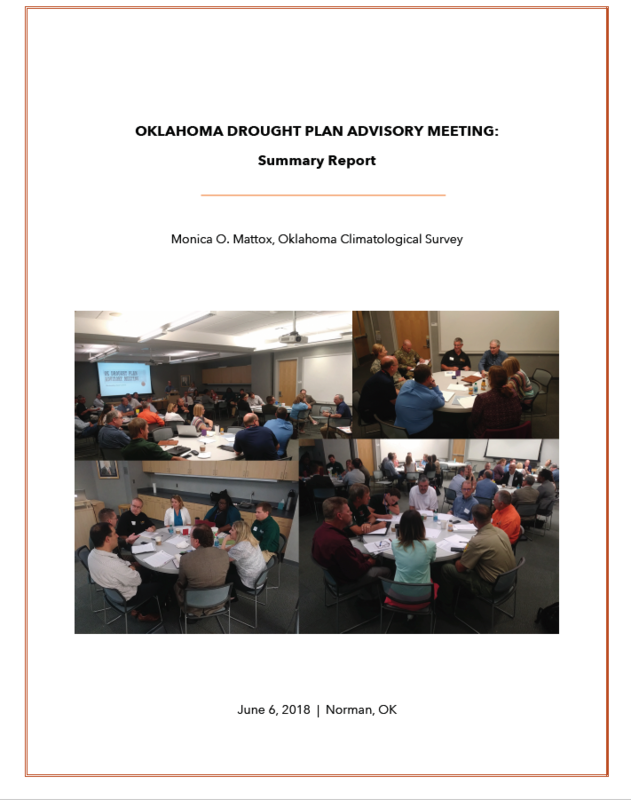 Historical drought information for Oklahoma climate division 6, which covers the southern Cherokee, northern Choctaw, and eastern Creek tribal jurisdictions and Adair, Cherokee, Haskell, Hughes, McIntosh, Muskogee, Okmulgee, Pittsburgh, Sequoyah, and Wagoner counties. Historical drought information for Oklahoma climate division 7, which covers most of Caddo-Wichita-Delaware, and the vast majorities of Kiowa-Comanche-Apache-Fort Sill Apache and Kiowa-Comanche-Apache-Ft Sill Apache/Caddo-Wichita-Delaware tribal jurisdictions and the Caddo, Comanche, Cotton, Greer, Harmon, Jackson, Kiowa, and Tillman counties. Historical drought information for Oklahoma climate division 8, which covers most of Chickasaw, western Choctaw, and far-eastern Kiowa-Comanche-Apache-Fort Sill Apache tribal jurisdictions and Atoka, Bryan, Carter, Coal, Garvin, Jefferson, Johnston, Love, Marshall, Murray, Pontotoc, and Stephens counties. Historical drought information for Oklahoma climate division 9, which covers the eastern half of the Choctaw tribal jurisdiction and Choctaw, Latimer, LeFlore, McCurtain, and Pushmataha counties. 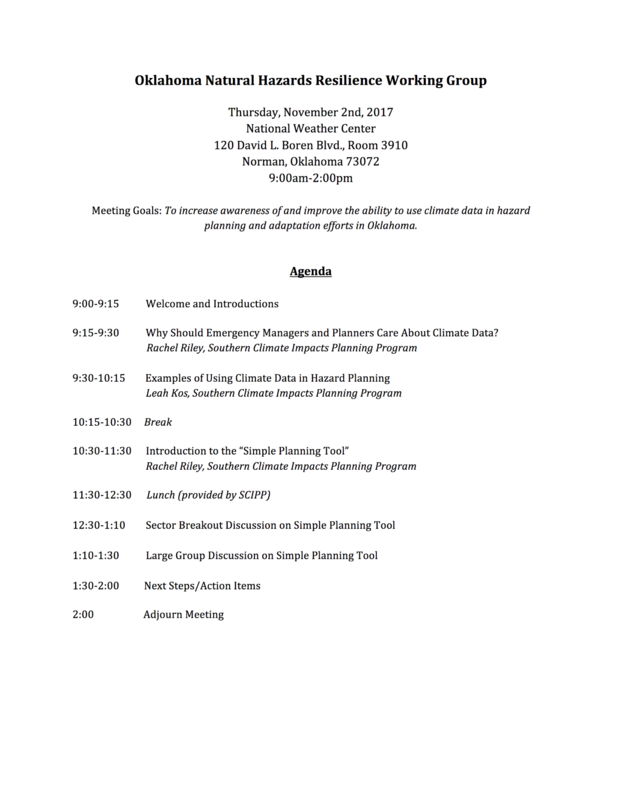 This is the agenda for the EM and Planner hazards workshop held in Norman, Oklahoma on November 2, 2017.